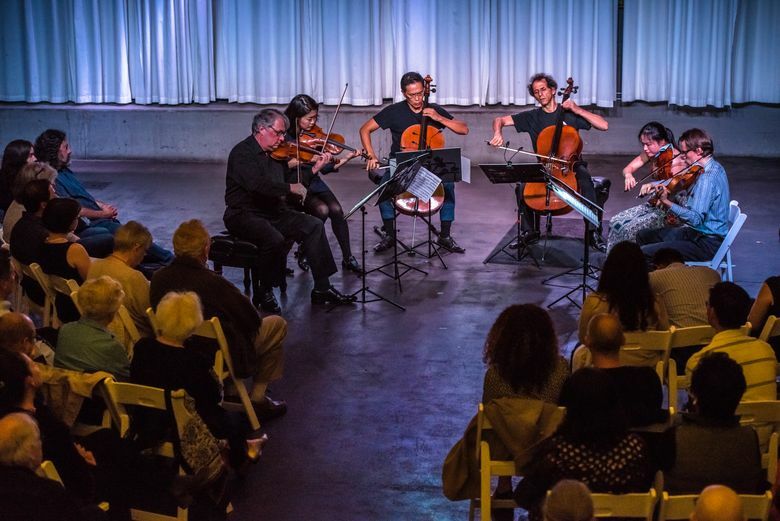 Emerald City Music founders Kristen Lee and Andrew Goldstein aim to bring audiences and artists together in their new chamber-music series, which focuses on making each concert more of a social experience. Think of Kristin Lee and Andrew Goldstein as the wizards behind Seattle’s new inclusive chamber-music series, Emerald City Music. Instead of performing magic, however, as did the fabled wizard of another Emerald City, they devote their energies to transforming what makes classical concerts so off-putting for some. In the process of creating a welcoming and more inclusive environment for intimate music-making, they promote their series by chalking street corners in South Lake Union to get the word out, treating social media as their friend, staging pop-up performances at Microsoft and Google, hosting meetups and collaborating with young professionals. Artistic director Lee, 30, is a Juilliard graduate and Avery Fisher Grant-winning violinist who regularly tours and records with the Chamber Music Society of Lincoln Center, performs at the Music@Menlo chamber-music series, and hangs with some of the finest chamber musicians around. Executive director Goldstein, 26, began interning at Music@Menlo while still a college student, and went on to work for chamber-music “power couple” David Finckel and Wu Han — artistic directors of Lincoln Center’s chamber society — before doing a turn at Seattle Opera. 8 p.m. Friday, Nov. 11, 415 Westlake, 415 Westlake Ave., Seattle; $45, includes one drink (emeraldcitymusic.org). Note: Program repeats at 7:30 p.m. Saturday, Nov. 12, at University of Puget Sound, Tacoma; $28-$43. He and Lee decided to target one key reason why people said they stayed home: Concerts remain a very individualistic experience that often doesn’t offer an opportunity to socialize. Over and over, people they spoke with said they wished they had a space to connect with other music lovers and artists in a far more personal way. Even in Emerald City’s larger, more traditional performance spaces in Olympia and Tacoma, boundaries are broken. People discover welcome cards on every seat that encourage dialogue around the evening’s theme. “It was amazing to see people in Olympia talking to neighbors they ordinarily would never speak to, build community, and then use their exchange about the concert theme to inform their experience,” Lee says. Emerald City’s forthcoming concert, “Darkness Visible,” which takes its name from a piano solo work by Thomas Adès, centers on the influence of French music on English music. “It’s sort of the brainier program of the seven we’re putting together this season,” says Lee. (Musicians include Lee, pianists Conor Hanick and Michael Mizrahi, flutist Tara Helen O’Connor and cellist Jay Campbell.) Early works by Britten and Dutilleux join the Adès, and are framed by two staples of the literature, Debussy’s Sonata for Cello and Piano, and Ravel’s Piano Trio. In the process, the concert intentionally erases boundaries between traditional and new music programming.